Are you looking for in-depth education on topics related to sustainable agriculture? feature to each of our tutorials. Each lesson includes a quiz that will test what you learned in that specific lesson. If you successfully pass all quizzes, you’ll get a certificate demonstrating your knowledge! This introduction provides an overview of the types of practices that maintain and perhaps even increase the health of your soils. In addition, it provides some compelling reasons, both economic and environmental, to implement the types of practices that support soil health–it’s basically about investing in the most important piece of “capital equipment” you have on the farm–the soil. This lesson will also cover some of the considerations that need to be taken into account when embarking on the path of soil stewardship. 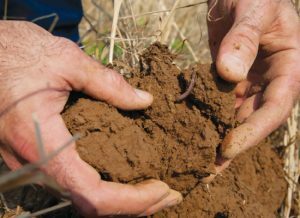 This journey is all about better understanding the ecology of your soils, and what you can do to support that ecology, which in turn will provide dividends in a healthier, more resilient cropping system. Healthy, functioning soils are productive with less outside inputs of fertility and pesticides. This lesson will teach farmers and ranchers several different on-farm soil assessments they can quickly and easily perform to determine the level of health in their soil. How soils function and symptoms of soil dysfunction will be discussed. The assessments also help to diagnose the cause of these symptoms of poorly functioning soil. The lesson concludes with a discussion of the five soil health principles and the ways those principles will regenerate soil health. This series of lessons is designed for farmers that would like to increase the energy efficiency of their farm and processes. It features tutorials on farm building efficiency, outdoor lighting, irrigation efficiency, solar, small-scale wind, and biodiesel. Have you heard that changing the way you manage your grazing animals can change the condition of your land and finances for the better? Interested in finding out more about how managing your livestock can improve your soil health, your pasture condition and your bottom line? This tutorial features sessions taught by National Center for Appropriate Technology specialists who are also livestock producers. They share years of experience managing their own pastures to inspire you to start wherever you are and build or refine your own managed grazing systems. Detailed presentations and real-world examples will get you on the road to managed grazing. This lesson includes: • Introduction to Managed Grazing; • Grazing Management: Inventory; • Managed Grazing Infrastructure; • Managing the Mature Stand; • Intensifying Managed Grazing; • Stockpiling Grass; • Fertility: Building Healthy Pasture Soils; • Monitoring Your Pasture. Are you a beginning farmer? Do you want to expand your markets? Do you want to add sheep, goats, or poultry to your operation? This “beginner” online course will help you develop a basic business and marketing plan for your operation, and provide you with information and worksheets to help you meet your farm goals. There’s lots of information about small livestock production, too. Most information is available in English and Spanish. The resources from this project were developed with funding from USDA and provide information in visual and audio formats. If you are thinking about farming as a career you’ve come to the right place. The eight lessons in this course will guide you through the process of imagining and planning a successful farming enterprise. You’ll also hear from several farmers who have made their dreams a reality.